Are you ready for a bold statement? Then here it is:. Yamamoto of Japan neoprene material is regarded as the highest quality wetsuit material among advanced freedivers. 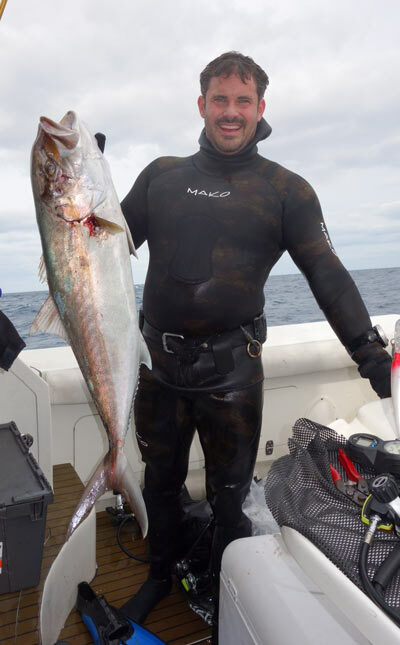 Two years ago, MAKO Spearguns teamed up with YAMAMOTO Neoprene of Japan to make some of the highest quality 2 piece open cell spearfishing suits in the world. 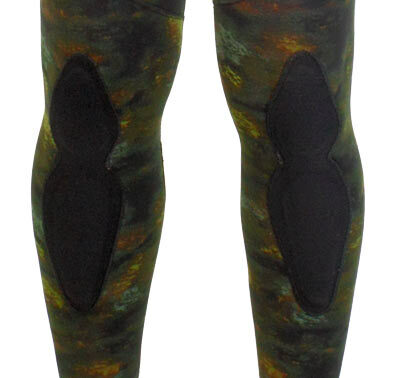 The result was our Yamamoto #39 Green Camo 2 piece wetsuits and we quickly became known as a supplier of some of the highest quality wetsuits in the industry, providing superior warmth, comfort and durability. 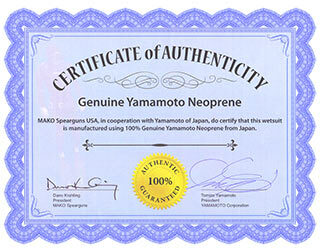 Our wetsuits are certified by Tomizo Yamamoto (President of YAMAMOTO Corporation) and me (Dano Krahling, President of MAKO Spearguns) to be Genuine YAMAMOTO Neoprene. Until recently, it was impossible to improve upon this suit. Now, a new Yamamoto outer material is available which offers 30 percent more stretch than any other outer material available. We call it Yamamoto "Mega Stretch" and it takes wetsuit technology to a whole new level. Serious freedivers are especially quick to recognize the increased lung capacity this material provides. Increased lung capacity means increased dive time and peak performance. Yamamoto #39 Neoprene: The finest neoprene material in the world. Integrated Ergonomic Hood: Ensures maximum warmth. Integrated knife pocket: This is a huge safety feature. Yamamoto "Mega Stretch" Camo Outer Material: This is the improved outer material which makes this the best suit available. HIGH WAIST BOTTOMS OR FARMER JOHNS? High Waist Bottons or Farmer Johns? You decide. Each suit comes with the Farmer John Bottoms for added warmth. However, if you prefer the High Waist Pants, no problem. We deliberately placed the upper seam in the appropriate spot to allow you, the diver to remove the shoulder straps by following (cutting) just above the strategically placed seam for a perfect and professional looking cut that will not fray. But, don't throw away the newly created tank top. You might want to save it for a chilly day. NOTE: Open cell suits are 20% warmer than closed cell suits. For example, a 5 mm open cell suit will be as warm or warmer than a 7mm closed cell (nylon lined) suit. The benefits include greater warmth and comfort with less bulk and less lead required to control buoyancy. Serious freedivers prefer these suits because they spend much more time in the water than bottom-time restricted scuba divers. NOTE: Open cell suits are not put on the same way as closed cell suits. Putting on an open cell suit is fast and easy. However, because the inside of an open cell suit is not lined, you must use a lubricant sprayed inside the suit. We recommend " Suit Slide" a scent free, non petroleum based lubricant designed for Spearfishermen. Once applied, putting on an open cell suit (unlined) is actually faster than putting on a closed cell (lined) suit. Also, check out Suit Fresh - the first product to clean, remove odors and condition your suit all in one. It is made with organic ingredients. It eliminates odors, uric acids, sweat, salts and sunscreen. EZ sprayer to make cleaning wetsuits fast, effective and easy. Suit FRESH does not require pre-mixing or a multiple step cleaning process. I'm a bigger guy, have broad shoulders and in the past I had to spend the big bucks on a custom made suit. These MAKO/Yamamoto suits stretch like crazy!!! and give you a custom fit without constricting. 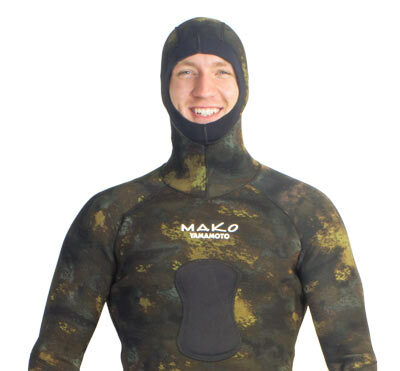 For the frequent diver whose is hard on gear like myself, I gotta say these Yamamoto Mako wetsuits are very warm for the mm thickness and extremely durable against reef snags. Thank you Dano and Mako from all the bigger guys out there for creating a suit that fits us like a glove without the custom price tag. Built in knife pockets save lives. Eliminates the possibility of becoming entangled in lines or nets. Average Customer Review: 5 of 5 Total Reviews: 113 Write a review. 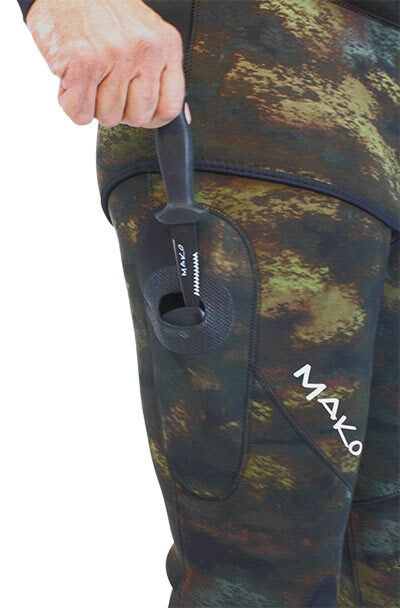 Communication with Mako was seamless and I received my wet suit within a few days. I am thoroughly pleased with the product and experience! Best customer service you can ask for with top quality products!